Except for podiums in Argentina and Catalunya, Repsol Honda’s Dani Pedrosa has under-performed all season. But that changed drastically Sunday when he won round 13 – the San Marino Grand Prix at Misano World Circuit Marco Simoncelli. It was a historic MotoGP win, also, marking the first time since the motorcycle World Championship began in 1949 that eight different riders won during eight consecutive races. Pedrosa, who earned his 29th premier class win (52nd of his GP career) and 103rd podium, started from eighth on the grid, but charged through the field and claimed the lead with seven laps remaining. 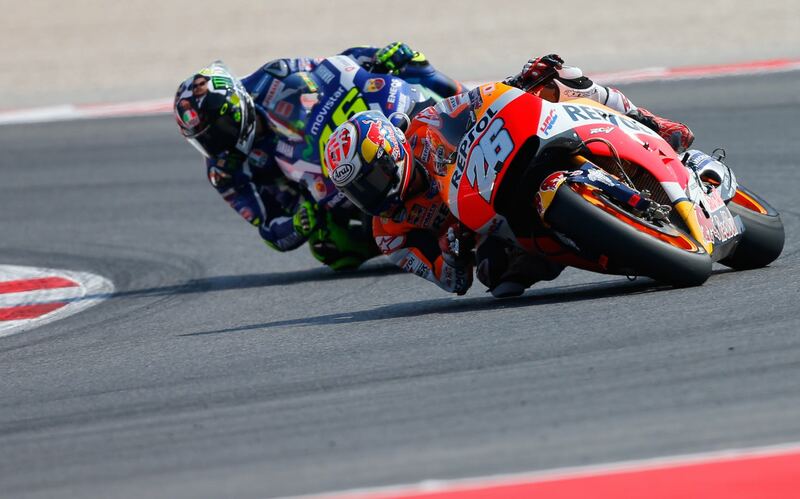 From there, Pedrosa, who rode on soft front/medium rear Michelin tires, opened up a gap, eventually finishing 2016 Misano MotoGP 2.837 seconds ahead of home favorite Valentino Rossi (Movistar Yamaha MotoGP), and 4.359 seconds ahead of pole sitter and the reigning World Champion, Rossi’s teammate Jorge Lorenzo. This also kept a personal record of winning a MotoGP race every year since joining the premier class in 2006. Dani Pedrosa says: “It was a great race, and it has been a long time since I’ve had these feelings. Even I was surprised by the performance I put in today because I hadn’t expected to go so fast; we were fantastic. The key was the pace; I was able to fight my way through, especially in the final part, and being consistent allowed me to catch the riders at the front. As for Pedrosa’s teammate, Marc Marquez finished fourth, and he remains the points leader with five rounds remaining. Marquez has 223 points, 43 ahead of Rossi and 61 ahead of Lorenzo. Pedrosa is fourth overall, 78 behind the two-time MotoGP Champion Marquez. Lorenzo got the jump from pole, leading the field into Turn 1 as the Mallorcan so often does, with front row starters Rossi and Maverick Viñales (Team Suzuki Ecstar) going head-to-head for P2 and the Italian coming out on top. Pedrosa got an incredible start from P8 to move him up into the front group, joining Viñales, Andrea Dovizioso (Ducati Team) and Marc Marquez (Repsol Honda Team) in the squabble for P3. Rossi soon struck back to sit up teammate Lorenzo at the final corner and push the reigning champion wide, taking the lead and leaving Lorenzo and Marquez to chase him down – with Pedrosa the fastest man on track and setting a new lap record. Making a move against his teammate look easy and getting down into the 1:32s, Pedrosa was on the charge. Setting his sights on Lorenzo and slicing through, the number 26 fixed his crosshairs on the race leader in Rossi’s backyard before passing the Italian with an aggressive move to sit him up and concentrating on making a gap at the front. Untouchable and back with a bang, the incredible ride through from P8 was completed as the “Baby Samurai” shook off a helpless Rossi to cross the line with a healthy margin, as history continues to be made with the eighth different winner in 2016. Marquez suffered a tough race to head over the line in P4, but retains a healthy 43 point lead in the title as the paddock head back to Spanish soil. Viñales completed the top five, beating home rider Dovizioso and temporary teammate Michele Pirro (Ducati Team) to the honour. Winner at Brno, Cal Crutchlow (LCR Honda) had a solid ride to cross the line P8 ahead of Monster Yamaha Tech 3 rider Pol Espargaro, and it was a fantastic showing from Alvaro Bautista in Aprilia Racing Team Gresini’s home race as the Spaniard completed the top 10. MotorLand Aragon now awaits: no longer enemy territory for Pedrosa, Marquez or Lorenzo as the flyways approach – and the season finale in Valencia gets ever closer.